Local shares rebounded strongly yesterday to end what has been a fraught week on a higher note. 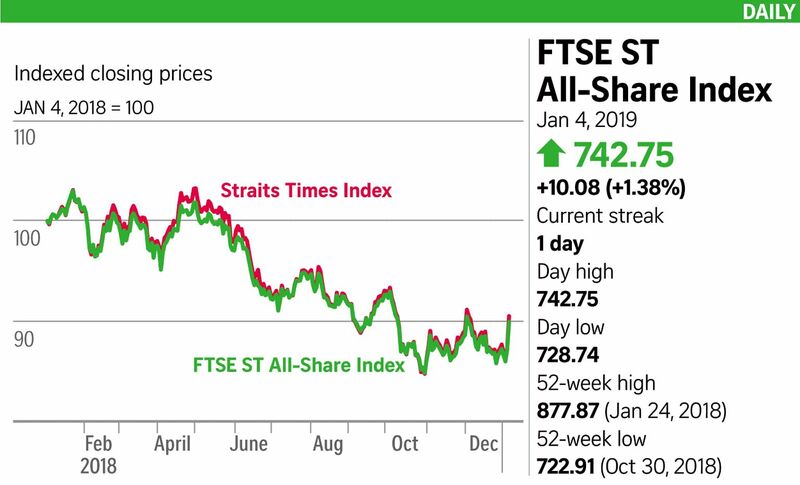 The brighter mood among investors sent the Straits Times Index (STI) advancing 1.5 per cent or 46.35 points to 3,059.23 and 0.19 per cent ahead for the week. This came on the back of declines of around 1 per cent in the previous two sessions. Stocks across Asia started the day on a weaker footing, after Wall Street's sell-offs overnight, but were boosted in the afternoon after news that the US and China would hold vice-ministerial-level negotiations on trade in Beijing next week. Most Asian stocks closed up on the day, except in Australia and Japan. Japanese markets were shut on Wednesday and Thursday and resumed trading yesterday. In Singapore, gainers powered past losers 264 to 142, with 1.29 billion shares worth $900.2 million changing hands. All three local banks rose, with DBS up 0.87 per cent to $23.29, United Overseas Bank adding 1.63 per cent to $24.38 and OCBC Bank putting on 1.27 per cent to $11.17. Among industrials, Keppel Corp, up 2.24 per cent to $5.94, and Jardine Cycle & Carriage, ahead 1.7 per cent to $35.88, stood out. OCBC Investment Research has maintained its "buy" call on Keppel Corp with a target price of $7.25, on the back of news that Keppel Land China is developing a new residential site in Chengdu. Analyst Low Pei Han said Keppel has a good track record in Chengdu, with six residential projects there. Keppel is also growing its commercial portfolio in Beijing and its offshore marine unit is expected to continue its recovery, said Ms Low. DBS Equity Research initiated coverage on Jardine Cycle & Carriage with a "buy" call and a $43.10 target price - an almost 24 per cent upside on the stock's opening price of $34.80. DBS said the share is a "South-east Asia proxy", offering "exposure" to regional economies. Tech stocks, which came under pressure on Thursday following Apple's first revenue caution in almost 12 years, regained ground. Venture Corp closed 1.48 per cent higher at $13.71 and semiconductor player UMS Holdings advanced 2.7 per cent to 57 cents. Creative Technology rose 6.76 per cent to $3.79, a stark contrast to Thursday last week when it plunged 16.75 per cent and triggered a query. The firm said yesterday that it has started taking orders for the first headphones with built-in technology based on its Super X-Fi system.